My knitting mistakes give me plenty of content for this blog. So does my patience (or lack thereof). Need an example? 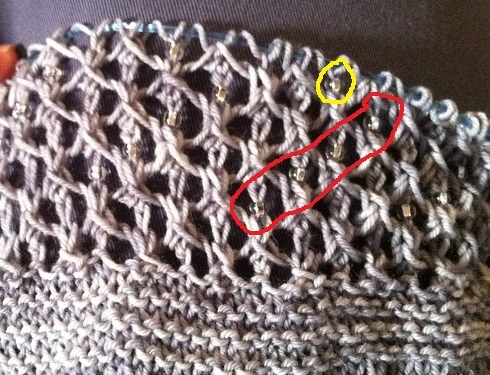 My beads were going in a nice diagonal (see red oval). Then, on the next row, the beads did not follow the diagonal (see yellow circle). Since that section was ending, I knew this couldn’t be right. Let’s back up a tiny bit. On the second bead row from the bottom of that diagonal, something didn’t line up right at the end, but I was able to continue the pattern until I ended the row evenly. I figured it was just a little mistake in the pattern, but I didn’t look up on the computer to see if this was the case. 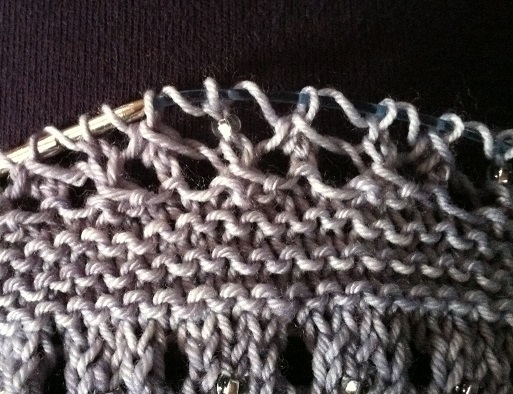 The other rows went on in a nice diagonal, giving me confidence that I had done the right “fix” myself. So, when that last row of beads didn’t fall in line with the diagonal, I figured there was a problem with that row, so i looked it up on Ravelry to see if there was any “errata” (mistakes found in the pattern and fixed). Sure enough, there was some mistake documentation. But not for that row. Apparently, it was for that whole diagonal bead section. After the first bead row, I was supposed to knit some non-bead rows. The next time to add beads was to be on the last row. So, that last row was correct. It was the other three rows of beads that were wrong! I wasn’t even supposed to put beads in those rows at all. The bead rows take soooooooo long. And I didn’t even need to do them!!! I stuffed everything back in the project bag and gave it a time out. I just couldn’t stand the thought of having to take out all those rows. And all those beads. My patience gets tested with things like that. I try and think of all the shortcuts. Can I fudge it? Will it look ok, even though it’s wrong? No, to both of those. The beads aren’t supposed to be there. No getting around that. So, I went to knit night, and in the good, chatty company of other knitters, I ripped out the whole bead section to prepare to start over. And in my excitement about getting it started again, I put the first bead row in two rows too early! Seriously??? The bead rows take sooooooo long. And I had to take it out. Again. My impatience kicked in and I considered getting a pair of pliers and cutting/breaking all the beads off. That’s how much I didn’t want to take it out. I decided that probably wouldn’t be the way to go — First of all, I didn’t know where to find pliers at my doodlebugs’ house and it needed to be done immediately (of course – couldn’t wait a couple of hours to get home, right? No way.). Second, I’d probably make a huge mess of exploding, broken beads and that wouldn’t be good around 2 1/2 year old doodlebugs. Third, knowing my luck, I’d end up exactly that many beads short at the end of the shawl. So, since naptime was still in progress, I did it while watching Days of Our Lives. I haven’t re-picked it up yet. Can you blame me? 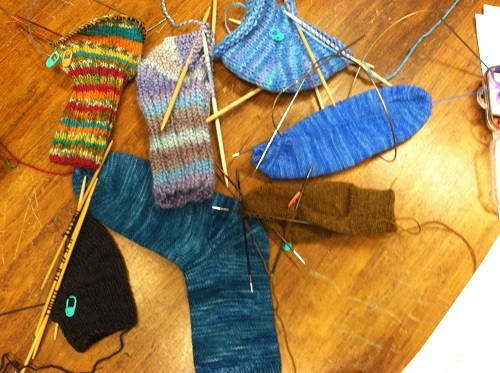 In other knitting news, as I mentioned above, last weekend I taught a class on how to do Cat Bohrdi’s Sweet Tomato Heel for socks. It was the first time I taught this class and everyone seemed to like it. A fun way to do a heel, if you need a non-heel flap option. Nice and smooth. Pretty easy once you get the hang of it. No pickup stitches which I find fiddle-y and no gusset decreasing which I find endless. Try it! Posted in Uncategorized and tagged cat bohrdi, glitz at the ritz, patience, sweet tomato heel on November 24, 2013 by lizytish.